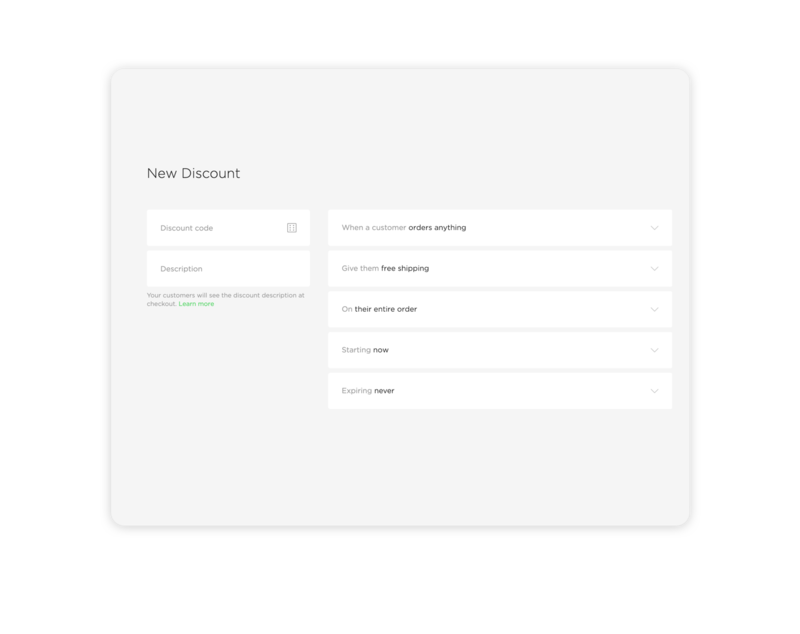 Creating discounts is easy, with a bunch of different ways to offer a break on your standard pricing. To get started, head to the Discounts area in your admin and hit the Add discount + button. Make the code something descriptive and fun: FREESHIPPING, SUMMERSALE, 2LEGIT2QUIT. You get the idea! Feeling stuck? Hit the dice icon and we’ll generate a code for you. FYI - only one discount code can be entered per transaction. Click the Add discount + button to create a new discount code. Give your discount a code, or click the dice and we’ll generate one for you. Enter a description for your discount. Decide which orders are eligible - when a customer orders anything, spends a minimum amount, or buys a minimum quantity. Specify what the discount offers - free shipping, a percentage discount, or a flat-rate discount. Specify which items in an order to discount - a specific product, a category of products, or the whole order. Decide how long the code will be active - now or on a specific date. Decide when the code expires - never, on a specific date, or after it’s been used a certain number of times. Click Save and share your new code with customers! 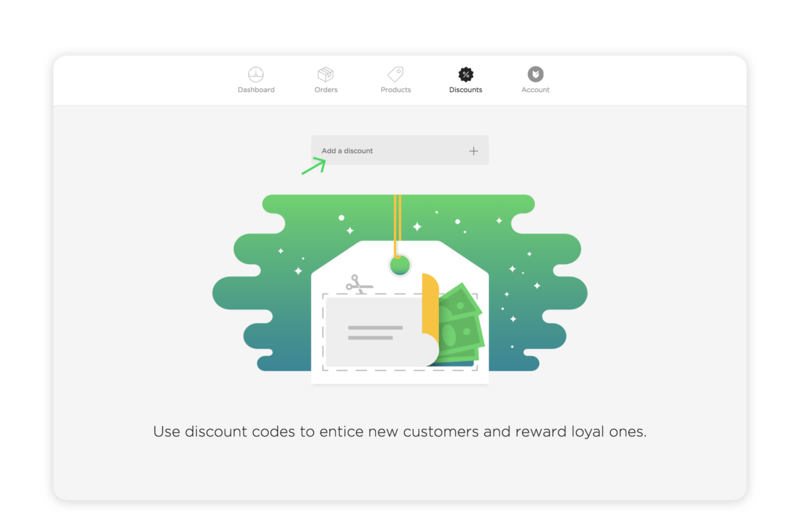 Tap the Add discount + button to create a new discount code. Give your discount a code, or tap the dice and we’ll generate one for you. Tap the Cart icon to start a new in-person order. 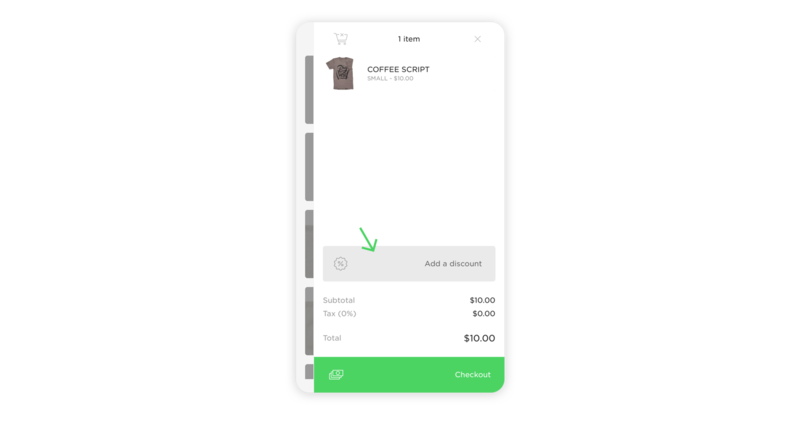 Add your products to the order and tap the discounts icon on the right. Enter an amount off or percent off for the order. Tap Done and complete the order.